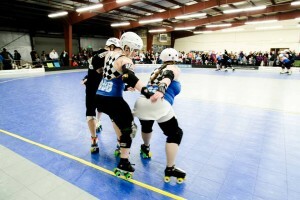 The Rat’s Nest is the new home of the Rat City Roller Derby, located in Shoreline, WA. It’s not just for us to practice at, either – we use it to host a variety of events, such as viewing parties and general excitement, and we’ll even play bouts there! Watch our events listing for opportunities to stop in at the Rat’s Nest and check out the excitement! Note that parking is limited. However, we are located across the street from the Shoreline Park & Ride, making it a convenient location to reach via Metro Transit buses. Take exit 176, for 175th St in Shoreline. Head west from the exit. At 99, take a right. Head north for .8 miles – the Rat’s Nest is on the right.